Today is the birthday of something new, something unique, and something that, for the first time, gives voice to the Performance-Based Contracting™ Industry. It is High Performance HVAC Today magazine. Though this publication is new, the messaging it will provide is not — it is more than 25 years in the making. 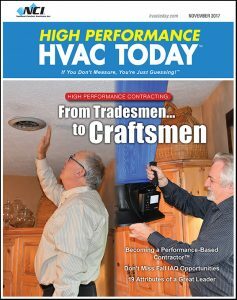 This magazine specifically targets those HVAC contractors who want to deliver true performance to their customers. Indeed, a Performance-Based Contractor ™ delivers comfort, safety, and energy efficiency using proven documented results. OK, so what does this really mean? Simply put, Performance-Based Contractors rely on airflow, pressure, and other measurements to diagnose HVAC system problems and identify solutions. Once these contractors resolve problems, they repeat the measurements initially taken to prove the system works as promised. This is known as HVAC system performance. 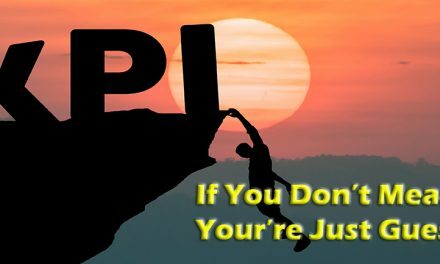 There are many in the industry today who tout “home performance” as the same thing. It is not. Home performance is all about the structure of the home and the mechanical equipment. It focuses on building pressurization and depressurization, windows, insulation, roofs and more. Don’t get me wrong — that stuff is important. But it is not the total answer. THOUSANDS OF HVAC CONTRACTORS HAVE EVOLVED THEMSELVES TO FOCUS ON PERFORMANCE-BASED CONTRACTING. THAT IS OUR AUDIENCE. The cover of the inaugural issue of High Performance HVAC Today for November 2017. HVAC performance is all about how the equipment and the ductwork work together, along with the influence of the building or home. Contractors can replace equipment with high efficiency furnaces, air conditioners, and heat pumps, but that doesn’t mean air delivered into the space is comfortable or energy efficient. If we don’t, as an industry, consider the ductwork — the delivery system for that air — we leave the bulk of the comfort and efficiency equation out in the cold. Thousands of contractors over the last 25 years, have turned their focus and energies (and training dollars) toward becoming high performance HVAC companies focused on performance-based contracting. They are literally an in industry within the overall HVAC industry. We dedicate High Performance HVAC Today to them. Our mission is not to usurp the domain of other trade magazines serving this industry. 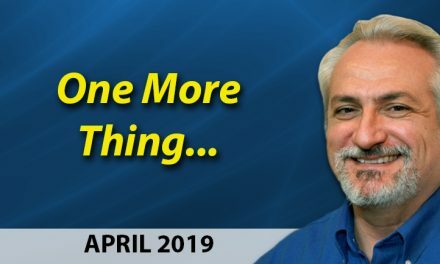 In fact, it is quite the opposite — our goal is to work in tandem with those publications as we focus on this small, but growing aspect of the HVAC Industry. Our editorial is written by high performance contractors for contractors who are also performance-based or who are considering taking that path. Our coverage will highlight the news and technologies that impact performance-based HVAC contractors and their customers. It will also cover the changes in the business that are necessary to successfully implement processes and procedures for operating as a high performance company. So happy birthday to High Performance HVAC Today. Please be sure to leave me comments and suggestions below. I am very interested to know what you think.